One of my coworkers recently told me that life was too short to finish reading a not-so-great book…”there are too many good books in the world, and not enough time”. It never occurred to me to NOT finish a book. My eyes would glaze over and skim through paragraphs waiting for something amazing to catch my attention, and before I knew it, I was seventy-three. Anyway, I found myself in the early pages of We Are All Completely Beside Ourselves by Karen Joy Fowler, intrigued by the Man Booker Prize Finalist distinction, and curious about what makes this book stand out from the pile. I was immediately invested in the main character. And then I wasn’t. I should tell you, I have my moments where I make life harder than it needs to be. This is no exception. Had I read the back of the book, I would have known that the book was about a girl who was raised with a chimpanzee, and consequently, would have decided never to read the book to begin with. But I did not read the back of the book. I should also tell you that I have nothing against books that tell stories of humans and chimpanzees coexisting, yet I do have issue with this being a piece of fiction. Because yes, oftentimes fiction is created from the ashes of reality, but I had a hard time connecting enough to the characters for my imagination to believe it really happened. I need that from a book (I can be such a brat). This is all perplexing to me because right now, as I’m typing this, I am reading the singing of praises from others at the front of the book, and it seems I am the only person alive who didn’t think this was Top Shelf. So what am I missing? The fact remains that there are more books out there that, for me, do it better. I’m off to search for them… wish me luck! I haven’t read much fiction in the last year because I have been enthralled with memoir. I can’t seem to turn away from a true story, especially one with enough conflict to rip your heart out and awe-inspiring resolution that takes at least a week to render you able to live in your own reality again. However, even though this book is not memoir, there are enough realistic elements in the characters and in the story itself to make it plenty of peoples’ true story. I would venture to say anyone who has ever been in love can relate to the marriage of Roy and Celestial, and anyone of color can certainly relate to the prejudices that resulted in the events that unfolded. Tayari Jones artistically placed us in deliberate scenarios where we could smell the room, taste the food, and see the landscape. We asked the questions along with the characters and couldn’t come up with the answers either. What occurred to me as I was reading this, was how important human connection is and how much faith we put in each other to love, to support, to live, to function. We aren’t created to be alone, and really we only want to be understood and accepted, flaws and all. While I was fighting in my heart for their marriage, what I was really fighting for was for Roy to find peace, and in the end, I think Jones wrote him home. Have you read this? If so, how do you think the title suits the narrative? For now, this website is going to be a catalogue of my reflections on books. In the future, it may be an online junk drawer that doesn’t close all the way. Life is full of fun surprises. The first book review of this new year is on a book that I read in October of 2018 (because this is me we are talking about, and since when have I done anything in the order in which it was assigned? Maybe third grade. Maybe). It’s not the most recent book that I have read, however, since reading this book my understanding of myself has intensified. And so, I didn’t want to bound into 2019 not having given it the attention it deserves. 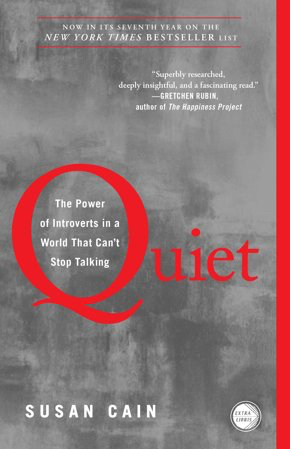 This book is Quiet: The Power of Introverts in a World that Can’t Stop Talking by Susan Cain. Reading this book has given me permission to say, “No”, to be alone with my thoughts, to be in a crowded room and reserve the right to not engage in conversation, and instead, observe. It has helped me to accept my awkwardness and unbridled embarrassment or guilt in select situations throughout my life and to forgive myself (again), gently close the door, and move forward. It has shed stadium lights on the differences between my husband and myself and made me more patient with his needs and more assertive in my own. [Side note: She gives an example of introverted patients who responded better to gentle, soothing speech when encouraged to do something - “I know this is hard”, “Very nice…”, “Keep up the good work” - versus extroverts who responded better to more aggressive language such as “You can do more than that!” and “Concentrate on your exercise!”. This explains in a nutshell the entire first half of my marriage to Tony. And while it was easy for us to chalk it up to his Sicilian heritage, I now realize that his extroverted nature plays a large role in his communication tendencies.] It has helped me to reflect (note I did not say “obsess”) on my past and learn how to navigate confidently into my future. I feel like I am who I was meant to be without the overwhelming urge to apologize for it, explain it, or God forbid, contort myself into someone else. The book, in my opinion, is not only a useful read for introverts. She discusses the differences and similarities between introverts and extroverts alike, as well as the complexities of both. Learning what makes us different is just as important as what makes us similar because by engaging in both, we learn how to communicate and understand. Not everyone can be pigeon-holed under a label, which is exactly the point. It’s about embracing your strengths, which you might have viewed as faults, and enriching your life through this new point of view. Live positively and be kind to yourself for who you are. Every once in a harvest moon, I come across a writer that knocks me over and rattles my creative cage and makes me think, "oh my goodness, there is someone out there that is reading my thoughts and WRITING THEM DOWN!" Abigail Thomas is one of these writers. 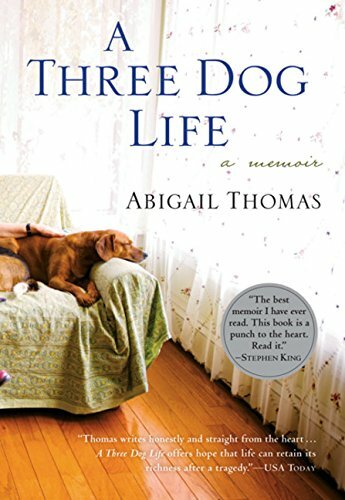 I have been devouring her memoirs after revisiting A Three Dog Life for the second time after reading it for the first time almost ten years ago. I was too young then. Even after finally owning my divorce and accepting my soul, old and wrinkly, I wasn’t able to grab onto the nuggets of truth that I would find in the pages of that book. The grief. I was missing what it was like to experience real grief. And now I get it. And so I can’t stop reading this woman. Throw in amazing word assemblage and a true gift for storytelling, and there you have the makings of a weekend spent snuggled in my chair with a couple dozen cups of tea. I’m kind of obsessed with her. Before I began writing this review, I decided that I would also write to her. I’ve never had to the urge to write to an author before this. Also, she’s in her seventies and I don’t want her to die before I’ve had the chance to thank her. I feel inspired and motivated to write again, and it feels like I am back to my old self. I didn’t realize just how much I missed her. Or how much I really do want another dog. Ahh! I have read about six books in the last two weeks!! It has been completely wonderful and I am trying desperately to document my favorite parts of each. The first one I want to share...it's another memoir. But in my defense, it is one of the most thought-provoking memoirs I have read. While Gilbert's thoughts on marriage were the catalysts for reflections on my own relationships and marriage in Committed, Kalanithi's When Breath Becomes Air spoke to the side of me that is obsessed with that place where a person sees their reflection, and their humanity stares back in all it's flawed beauty, suffering, shortcomings and burdens. Remarkably, he is also able to highlight the pieces of us that are good and hopeful...the shreds of selflessness, sacrifice, forgiveness, and unbridled, plentiful love...not reserved for only those closest to us, but for complete strangers. I found that I wanted to know him, and more than that, I wanted to emulate the parts of him that made him exceptional. I highlighted so many passages I can not even list them all here...and there are countless authors that I will read because of his mention of them. As a nurse, I felt a kinship to his heart as a physician, as a student of literature I drank in his vast knowledge of books, and as a human being, I wanted to thank him for being so completely honest and insightful and kind. Before operating on a patient's brain, I realized, I must first understand his mind: his identity, his values, what makes his life worth living, and what devastation makes it reasonable to let that life end. The cost of my dedication to succeed was high, and the ineluctable failures brought me nearly unbearable guilt. Those burdens are what make medicine holy and wholly impossible: in taking up another's cross, one must sometimes get crushed by the weight. To say I recommend this book is an understatement, and if you are in the medical field, it is a must read.